Ang bilis ng panahon, Bes! December na naman! Do you know that many people get married in this month, particularly in the Philippines? Well, it makes a lot of sense. In our culture, we usually associate December to reunions. It is when family and friends finally come home to meet everyone. Therefore, it’s also a great time to celebrate an occasion like wedding. Budget is also a consideration. Since we Pinoys love Christmas and we really look forward to it, it’s just normal for us to also save up for the holidays and all the happenings. For those working, it is also the time for the much-awaited 13th month pay, plus all the other types of bonuses they are entitled to. In short, maraming mayaman ‘pag malapit na ang Pasko. 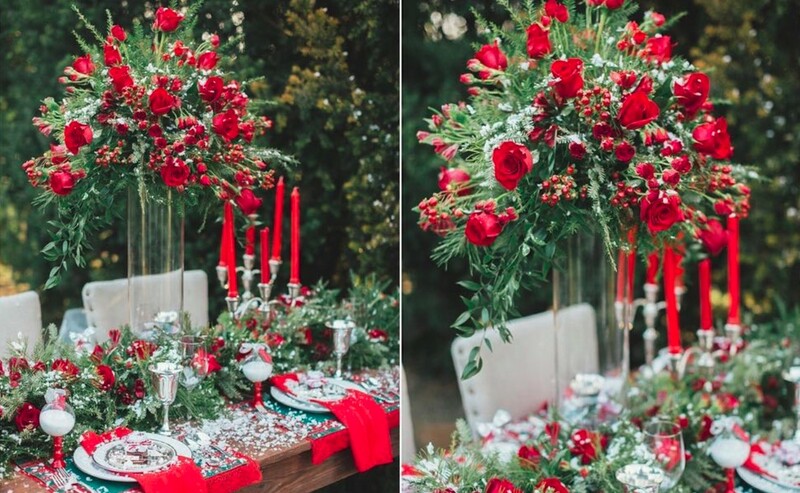 There are lots of things you can do to highlight the festivities during the season even in your wedding centerpieces. Besides using vivid shades of red and green, which never fail when it comes to evoking Christmas feelings, you may also play with silver and gold, which are both timeless. And yes, don’t hesitate to also play with some Christmas lights for added drama. If you think you can’t put a Christmas twist on a wedding cake without compromising its elegance, well, think again. Remember that this is actually possible, although you still need to be more careful when deciding on its overall look. Among the safest bets would be choosing snow as part of your theme. Yes, let it snow! But of course, you may also use fool-proof colors like red, green, silver, and gold. Classic white cakes can also go a long way, as long as they’re jazzed up by elegant Christmas-y embellishments. In fact, a simple yet lovely cake topper will do! Oh, sure! You can definitely send out Christmas-themed wedding invites and save-the-date cards, too. In fact, these may double as greeting cards, complete with your pic, warm greetings, and Christmas-themed hues and design. Don’t hesitate with the glitters and ribbons, for they can surely take your invites to a whole new level. And, instead of having everything printed, you may also go DIY by trying to learn some calligraphy techniques which you can use in beautifying the cards. Actually, you can also play with your bridal bouquet, so you are free to use not only blooms of particular colors. If you are feeling extra creative, for instance, you may include some Christmas balls in the arrangement for a more festive look! Don’t be afraid to experiment. Come on guys, it’s 2017! If you wish to have a wedding that’s more of Paskong Pinoy-inspired, of course you can also add some local twists to the elements that you are going to use for your big day. Just be creative and seek help from experts for best results. Happy holidays and good luck on planning your wedding!